The cover art of Gris, starring the game's eponymous protagonist. Gris is an indie platform-adventure game by Spanish indie developer Nomada Studio and published by Devolver Digital for Nintendo Switch, macOS and Microsoft Windows. The game was released on 13 December 2018. The game follows a girl named Gris, who wakes up in the palm of a crumbling statue of a woman. She attempts to sing out, but quickly becomes choked up and the statue's hands crumble, dropping her to the colourless earth below. After landing, the girl continues walking forward and discovers a number of strange structures that seem to be powered by mysterious points of light resembling stars. The girl can collect these lights to gain new abilities, such as turning into a block of stone, and to create new pathways made of constellations. After reaching a central tower, the girl can travel to four new locations to collect lights and restore colour back to her world at statues resembling the broken one from the beginning of the story. These areas include a world filled with windmills, a lush forest, and underwater caverns. Along the way she encounters various living beings, some of which help her on her journey as well as shadowy bird-like creatures which manifest as larger monsters that threaten to consume the girl. The final power the girl obtains is the ability to sing again, which bring life to various plants and mechanical animals. The girl eventually collects enough stars to form a constellation path to the heavens but the final pathway is blocked by the creature, who morphs into a monstrous form of herself and swallows the girl whole. She wakes up in an ocean of toxic black sludge and swims to the surface. As she climbs a tower rising out of the ocean, the creature tries to pull her back. However, the girl begins singing and the statue begins to reform itself through the power of her voice. Just before she is completely consumed by the black oil, the statue comes alive and begins singing as well, banishing the creature and the sea of despair. The girl and the statue tearfully embrace and she climbs the final constellation path as the world is shown to be restored in colour and light. Gris received "generally favorable" reviews, according to review aggregator Metacritic. EGMNow wrote that "with an arresting art style and admirable commitment to minimalist game design, Gris manages to turn a straightforward, often derivative platformer into something that feels far more special and important." GameSpot stated "Gris understands intrinsically how magical video games can be and continually pushes your imagination until you're almost bursting with joy. The ways in which it reinvents itself as you gain powers and dive ever deeper into this world is truly special, and just as it knows exactly when to pull back the camera or introduce a new song, it's keenly aware of when it's time to say goodbye. Like a comet streaking across the sky, Gris is full of wonder and beauty and leaves you with a warm glow in your heart." 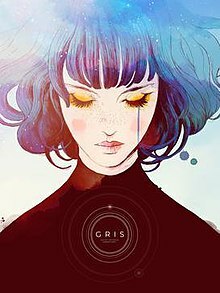 As of March 2019, Gris has sold 300,000 copies worldwide. Nomada Studio has confirmed the game has sold evenly across Nintendo Switch and PC. ^ Caballero, David (4 December 2018). "What does GRIS mean? We talk to Nomada Studio". Gamereactor. ^ a b "GRIS for PC Reviews". Metacritic. CBS Interactive. Retrieved 13 December 2018. ^ a b "GRIS for Switch Reviews". Metacritic. CBS Interactive. Retrieved 13 December 2018. ^ Moyse, Chris (13 December 2018). "Review: GRIS". Destructoid. Enthusiast Gaming. Retrieved 13 December 2018. ^ a b Harmon, Josh (13 December 2018). "Gris review". EGMNow. EGM Media, LLC. Retrieved 13 December 2018. ^ Blake, Vikki (13 December 2018). "Gris review - an evocative, ethereal experience you don't want to miss". Eurogamer. Gamer Network. Retrieved 13 December 2018. ^ Kato, Matthew (13 December 2018). "Gris Review - Not All Who Wander Are Lost". Game Informer. GameStop. Retrieved 13 December 2018. ^ a b Mc Shea, Tom (13 December 2018). "Gris Review - Seeing In Color". GameSpot. CBS Interactive. Retrieved 13 December 2018. ^ Crowd, Dan (12 December 2018). "Gris Review". IGN. Ziff Davis. Retrieved 13 December 2018. ^ Hall, Charlie (12 December 2018). "Gris is about the fear we live with, and finding voice to defeat it". Polygon. Vox Media. Retrieved 14 December 2018. ^ Scullion, Chris (13 December 2018). "GRIS Review (Switch eShop)". Nintendo Life. Gamer Network. Retrieved 13 December 2018. ^ Cryer, Hirun (13 December 2018). "Gris Review". USGamer. Gamer Network. Retrieved 13 December 2018. ^ Kaaraj (31 December 2018). "Test : GRIS : Un superbe univers à la narration minimaliste". jeuxvideo.com (in French). Retrieved 31 January 2019. ^ Ahern, Colm (13 December 2018). "Gris review". VideoGamer.com. Resero Network. Retrieved 13 December 2018. ^ "Nomada Studio Interview with the creators of GRIS". NintyGamer. 2019-03-29. Retrieved 2019-03-29. ^ Keyes, Rob (3 January 2019). "2018 New York Game Awards Nominees Revealed". Screen Rant. Valnet, Inc. Retrieved 7 January 2019. ^ Pedersen, Erik (2 February 2019). "Annie Awards: 'Spider-Man: Into The Spider-Verse' Snares Best Animated Feature & Six Others – Winners List". Deadline Hollywood. Penske Media Corporation. Retrieved 3 February 2019. ^ Makuch, Eddie (10 January 2019). "God Of War, Spider-Man Lead DICE Awards; Here's All The Nominees". GameSpot. CBS Interactive. Retrieved January 11, 2019. ^ "Nominee List for 2018". National Academy of Video Game Trade Reviewers. 11 February 2019. Retrieved 13 February 2019. ^ "Winner list for 2018: God of War breaks record". National Academy of Video Game Trade Reviewers. 13 March 2019. Retrieved 13 March 2019. ^ Trent, Logan (11 February 2019). "Here Are Your 2019 SXSW Gaming Awards Finalists!". South by Southwest. Retrieved 15 February 2019. ^ Good, Owen S. (4 January 2019). "Red Dead Redemption 2 tops list of Game Developers Choice nominees". Polygon. Vox Media. Retrieved 7 January 2019. ^ Williams, Mike (20 March 2019). "God of War Wins Another GOTY at 2019 Game Developers Choice Awards". USGamer. Gamer Network. Retrieved 21 March 2019. ^ Fogel, Stefanie (March 14, 2019). "'God of War,' 'Red Dead 2' Lead BAFTA Game Awards Nominations". Variety. Penske Media Corporation. Retrieved March 14, 2019.